However, if it’s sales forms entries like customer invoices that use the product/service item code, then it’s not possible to do batch reclass from one account to another account. The same thing applies to purchases (like inventory purchase) that use Items details tab. So, if your original entry is Journal Entry type or Sales form or Product/Service Item, you can’t do batch reclass. You can’t also batch reclass class/location in regular QBO. 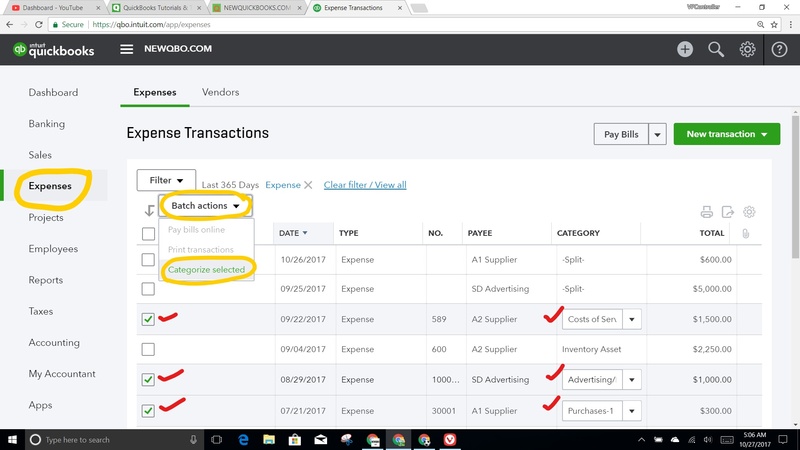 From the homepage dashboard > Expenses > Expenses > Select transactions need to be reclassified to another account category > Select “Categorize selected” under Batch actions > Select NEW Category > Apply.